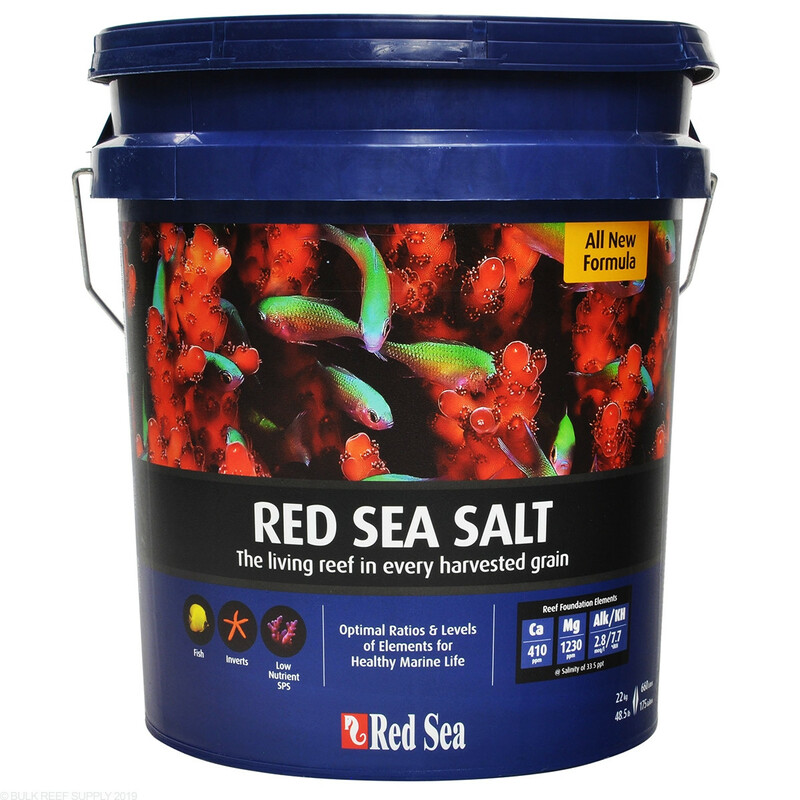 Red Sea Salt provides the biologically balanced, natural levels of the foundation elements (Calcium, Magnesium & Carbonates) necessary for mature aquariums and enhanced coral coloration. BRS recommends using a complete salt mix, to save money and time on testing supplies and major element adjustments. *When mixed to 1.021 specific gravity. 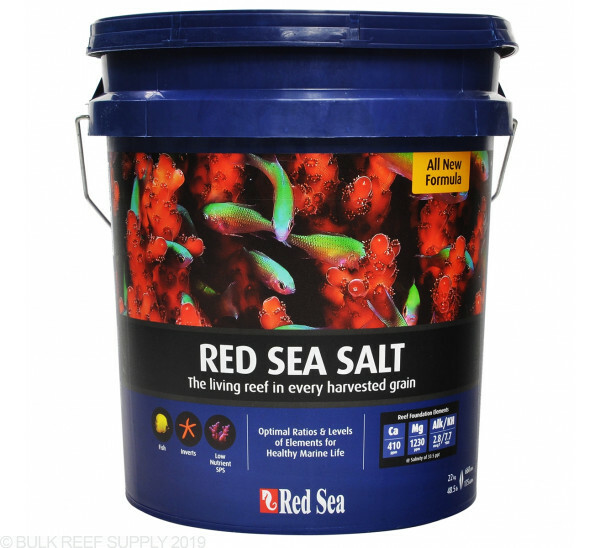 The new formula of Red Sea Salt is the product of years of research into the physiological demands of corals in the reef aquarium. Unlike the natural reef environment, which has an immeasurable reservoir of all 57 elements, a reef aquarium is an artificial environment that is constantly affected by coral growth and other ongoing biological processes. 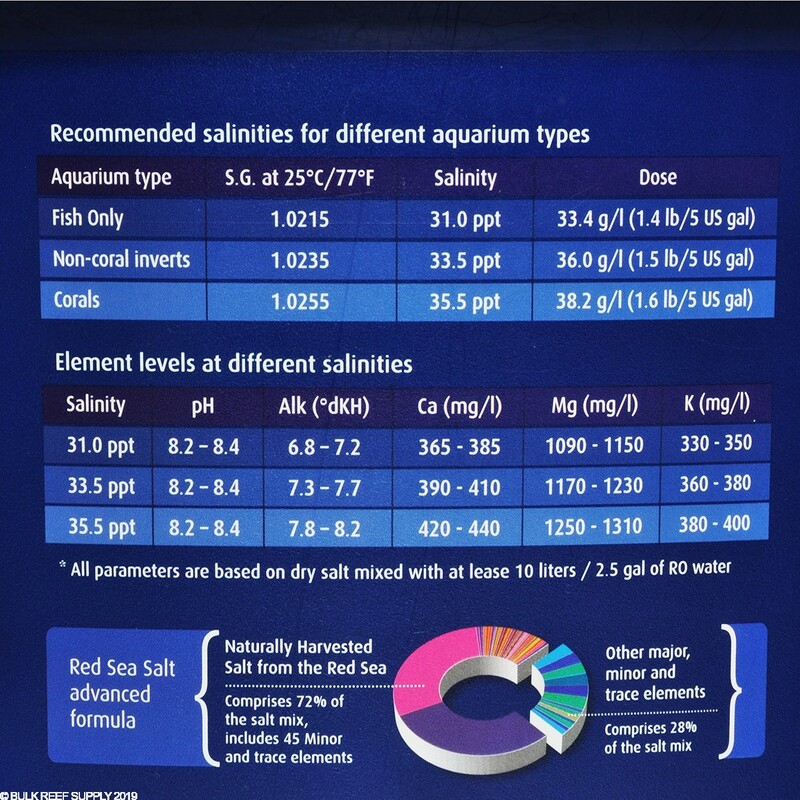 Red Sea Salt is formulated for use with RO water. 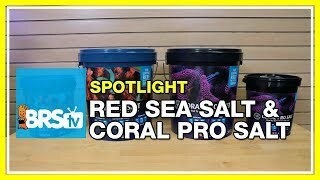 Both Coral Pro and regular Red Sea Salt use the same raw materials, including the unique Sodium Chloride harvested from the Red Sea reef, and both have optimally balanced ratios between the foundation elements: Coral Pro Salt contains elevated levels of foundation elements set for accelerated coral growth, while Red Sea Salt contains natural levels set for mature aquariums and enhanced coral coloration. I ordered 4 of the 175 gallon buckets and they arrived in a timely manner. The only issue I have is that all 4 of the buckets or severely cracked. Salt is good but the last 4 times ive got a bucket (big or small) the bucket was broken and twice the salt was hydrated due to being open. BRS took care of it fast and made it right, like the pros they are, however I have moved on to a better packaged salt. For years I was using the Pro coral salt which has a higher Alk but my tank is very low on nutrient even with skimmer off. My corals are happy at DKH 7-8 and this salt is perfect for that. It also mixes very easily too. I bought this because it has great reviews and I'm sure it will give my reef tank all the nutrients it needs once I mix it and put it in the tank. However the handling and packaging it comes in is not the best. One of the canisters has a big crack all the way down the side. It doesn't look like the bag inside ripped or that that salt has been contaminated. But it could have easily been punctured and I would have been left with a ox full of contaminated salt. BRS please find a way to package these containers better so that this doesn't happen. Great product, dissolves fast and no residue! Consistent every bucket! Over the years I've used Coral Pro, Aquaforest Reef Salt, and NeoMarine. Eight months ago I switched to Red Sea Salt as I was not the least bit pleased with the results I was seeing with the Aquaforest. I'm very glad I switched. I have mostly softies, and they have responded to this salt wonderfully. It dissolves almost instantly, leaves absolutely no residue or scale, and can be ready quickly in an emergency. It is far and away the best salt I have used. Try it! Recently switched from RS Pro to this to help lower my fresh SW dKH. Very happy I did. The salt produces exactly what is on the label each and every time I make a batch. This is not always true of other brand salt mixes as many reefers will attest to. I even ICP tested fresh batches twice and the parameters where nearly perfect each time. This was from two different buckets months apart. Years ago the trend was to keep your Alk in the 11-12 range and that is what I did with small amounts of success. Made the transition to the blue bucket and immediately saw improvements in SPS and LPS growth and polyp extension. This product allows for a much more reliable approach to 2-part dosing as well, with much more room to make adjustments in just Alk if that is what your system specifically requires. Great salt but the bucket does not survive shipping. I have salt that is contaminated with packing popcorn bits. I want to buy this salt in a 200 gallon box like IO. I've been using this salt for over 4 years. Very consistent, mixes quickly, no residues left behind, and mybatch is typically spot on. It has raised in price over the years, but it's too good of a salt for me to look for something cheaper. A salt thats proclaimed numbers match. I was playing the chase game with another salt. I could not get my number's right because of the high calcium to alkalinity. So I switched to this salt. The "my batch" numbers were almost identical to what I tested my first batch at. Corals looked very happy after that first water change. No more chasing numbers, just maintaining with a good 2-part. I mix 2.5 cups at a time with 20 minutes in between then slowly raise the temperature to the tank's. Mixes clear in no time, PH stable in a few hours. This may vary considering many factors. Ordered three times and I have received the same batch number. This batch comes out to Alk, 8.6-8.7 Cal, 430-445, and Mag, 1390. I measure each new batch before it goes in the tank and they have been consistent with the "my batch" numbers. This has been a life saver. A great salt. It has been quality since the beginning. Been using it for over 10 years and it is always great. Would the Red Sea salt work in a 16 gallon soft coral nano tank? Thank you for reaching out to Bulk Reef Supply! I believe you are asking about the Red Sea "blue bucket"? If so, Yes! The parameters are ideal for a reef tank. 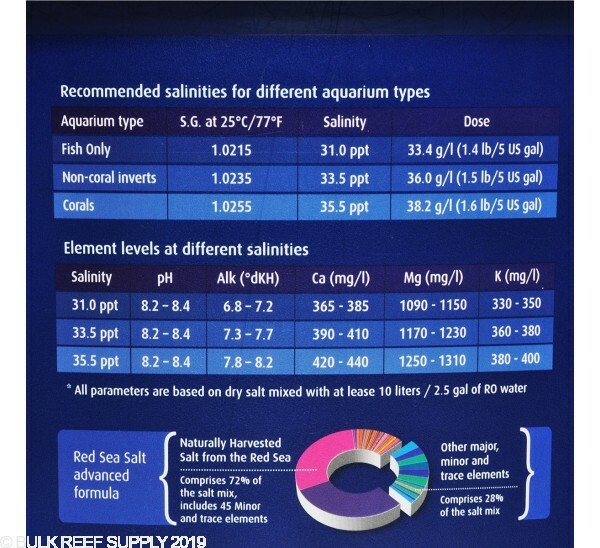 With the lower consumption rate of Alk and Calc from soft corals you should be able to keep ideal levels fairly consistent in your reef with just regular water changes. I hope this was helpful. Please reach back out if you have any further questions!